I removed the drop ceiling from my basement, the next step would be to paint the concrete ceiling. However, as you can see from the picture, there are pieces of wood on the surface of the concrete. 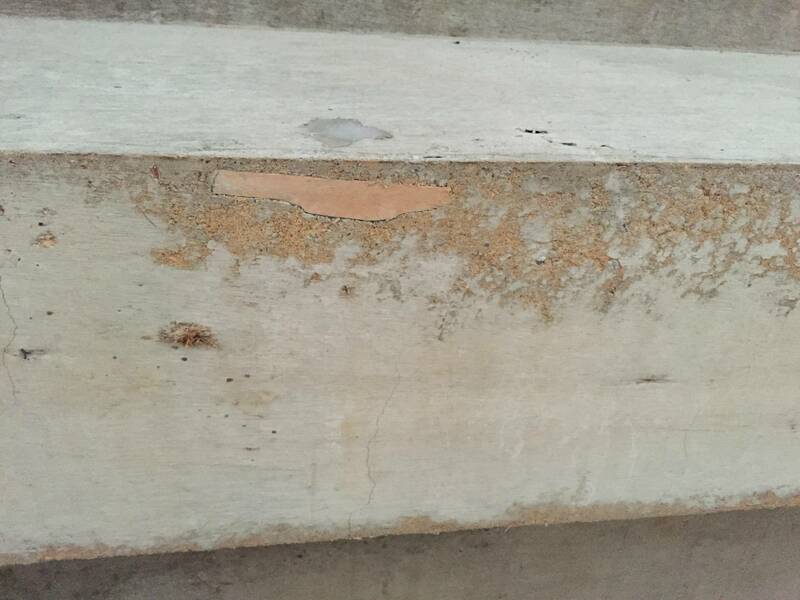 I tried to sand the surface to remove them and up to a certain point it seems to be working, but some larger chunks are somewhat deeply embedded into the concrete and sanding will not work. My question is, do I need to remove that wood? If I simply paint if over (multiple layers of sealer + paint, I presume), will it peel off? If it would be to completely remove the wood, any suggestions on how to do that? Or would it be smart to apply some sort of putty patches to cover the wood, or would those too fall offd? I don't mind about the uneven surface or rough look. Thanks for any hints or advices! For those who may encounter the same problem: What I've done is the following: after lots and lots of asking around and researching, the finding was that it is probably best to remove as much as possible from the wood (not only the sawdust). But sanding it is not an option, since it's simply not efficient plus it creates a ridiculous amount of dust. So the winning tool was the wire brush + chisel combination, plus mortar on top of it. It's tedious, but once it's done and after the appropriate waiting time you have the paint on it, you're glad you did it. You might hit it with some sand paper on a sanding block, as it loos like there is sawdusrt along with the wood chips. I would expect some of it to fall out, but probably not the larger chips. The sawdust falls into the category of "loose dirt" potentially, so knocking off loose dirt is a good thing. Not the answer you're looking for? Browse other questions tagged concrete basement ceiling or ask your own question. How can I tile the raised edges in my basement? Is there a benefit to painting concrete floors? Removing drywall from concrete ceiling, do I need to worry about something?